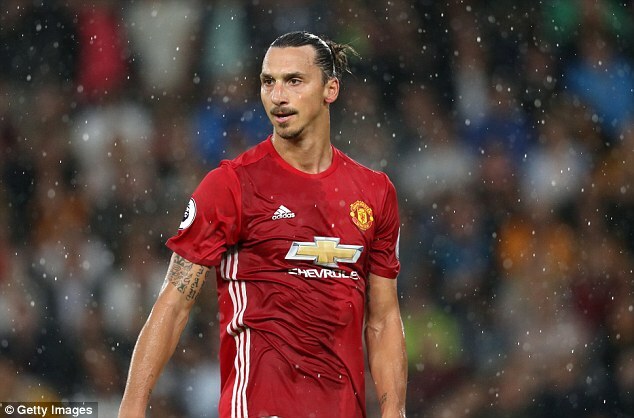 Zlatan Ibrahimovic will attempt to KO Manchester City in the Premier League’s heavyweight contest on September 10 before dashing to London to watch Kell Brook’s bid to shock the world against Gennady Golovkin. 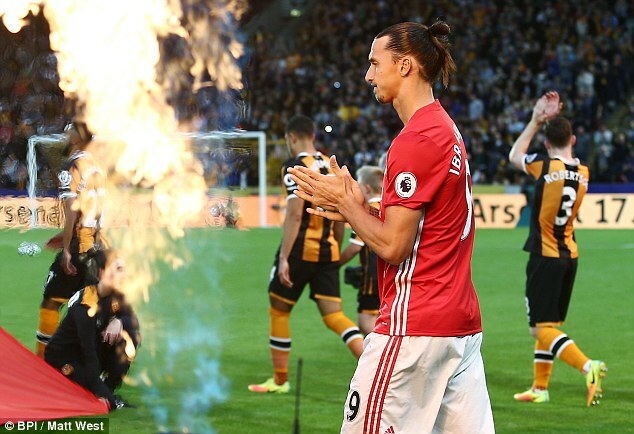 Ibrahimovic will get his first taste of the Manchester derby when United take on City at Old Trafford in the day’s early kick-off as Jose Mourinho and Pep Guardiola go head-to-head for the first time in the Premier League. And the big Swede already has plans for the evening as he hopes to make it down the M6 in time to be ringside at the 02 Arena for the anticipated middleweight title clash between the two unbeaten fighters. Ibrahimovic, who arrived at United on a free transfer from Paris Saint-Germain this summer, is a big fan of Kazakh knock-out merchant ‘GGG’ Golovkin, who is on a hot streak of 22 stoppage wins in a row. And promoter Eddie Hearn has revealed that he got a phone call from boxing nut Wayne Rooney to request a ticket for his new team-mate. Rooney is a regular at boxing shows and is close friends with Liverpool’s famous boxing brothers Paul, Liam, Stephen and Callum Smith, while his manager Jose Mourinho has watched Anthony Joshua box at the 02 Arena too. Hearn said: ‘Wayne Rooney phoned me on Saturday night from the United team bus after their win against Hull. He said ‘Zlatan is a big Golovkin fan, can he come to the fight?’ I said ‘absolutely – of course’. ‘They’ve got the big derby early that day then they’ll be heading down to the fight, along with many other sports stars and actors, all kinds, to attend a really special event. But Sheffield United fan Brook has no problem with Ibrahimovic cheering on his opponent when he climbs between the ropes for the biggest fight of his life. Brook said: ‘If I win him over or don’t, if he’s there to see me win or lose, he’s still there to see me fight and that’s what it’s about. ‘Everyone has got their own opinion or their own favourites. ‘There will be a lot of Golovkin fans and a lot of fans there for me. 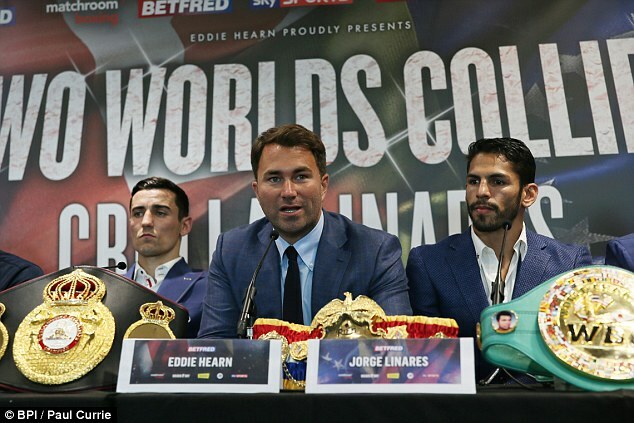 But they are there and are part of a fantastic fight, it’s going to be an event, they’re going to be part of it and that makes me smile. 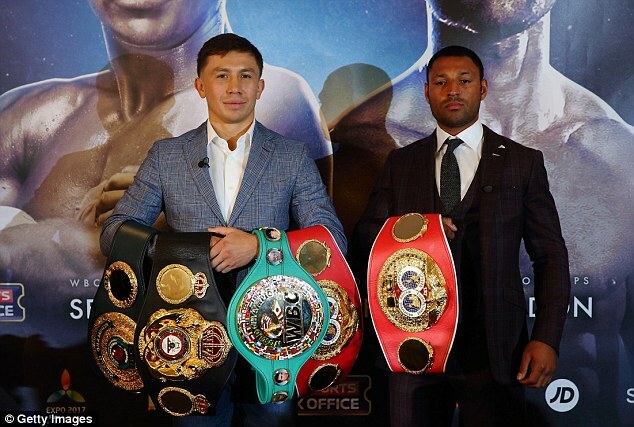 IBF welterweight champion Brook is stepping up two divisions in order to face WBC, WBA and IBF champion Golovkin at the 160lb middleweight limit. And he says the extra weight will help rather than hinder him as he attempts to become the first man to ever beat 35-0 Golovkin as a professional. Brook added: ‘I’ve been able to train very hard because I’ve got the fuel, and my recovery has been a lot better because I’m getting much better sleep. ‘I train very hard for every fight but I think that the way I feel, this is the best I’ve felt in a camp. ‘I’m 30 years old and I’ve been making those lighter weights since I was amateur. It is a struggle and I’ve put a lot of muscle on over 10 or 12 years. ‘It’s very hard to make welterweight so of course I’m a very happy fighter now. Making this natural weight for me mean I’ve been a lot more fun to be around.